The army ants' jaws are so powerful that Indians once used them to suture wounds: the tenacious insect was held over a wound and its body squeezed so that its jaws instinctively shut, clamping the flesh together. The body was then pinched off. Larvae carried by workers produce pheromones which stimulate the army to keep on the move. When the larvae begin to pupate and no longer exude their chemical messages, the ants bivouac in a vast ball in a hollow. They actually cling to one another and make a nest of their bodies, complete with passageways and chambers where the eggs are deposited. Once the queen lays her eggs and these hatch as larvae, a new generation of workers and soldiers synchronistically emerges from the stored pupae. The larvae begin to secrete their characteristic pheromone, and the army is again stimulated to march off and terrorize the rainforest. 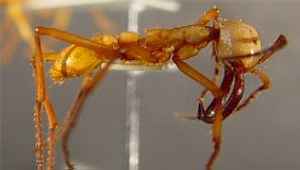 The most terrifying ants of all are the army ants, which march through the forest with the sole intent of turning small creatures into skeletons in a few minutes. They produce a faint hissing sound and distinct ant army odor. They're like a wolf pack, but with tens of thousands of miniature beasts of prey which merge and unite to form one great living creature. Hollywood images of mammals and even humans fleeing madly before them are mostly imagination run wild. In truth, while the ants advance across the forest floor driving small creatures in front of them, humans and other large creatures can simply step aside and watch the column pass by--this can take several hours. Lomas de Barbudal Biological Reserve is part of the National Parks System of Costa Rica. It is known for its diversity of insect species. There's something endearing about the leaf-cutting ant (Atta cephalotes), a mushroom-farming insect found in lowland forests throughout Costa Rica, carrying upright in its jaws a circular green shard scissored from the leaves of a plant. At some stage in your travels you're bound to come across an endless troop of "media" workers hauling their cargo along jungle pathways as immaculately cleaned of debris as any swept doorstep. The nests are built below ground, sometimes extending over an area of 200 square meters, with galleries to a depth of six meters. Large nests provide a home for up to five million insects. (All ant societies are composed entirely of females; males exist only to fertilize the queen and then die. And only the queen, who may boast a thousand times the body weight of a minor worker, is fertile. Hence, all other ants in the colony are her daughters.) They set off from their nests, day and night, in long columns to demolish trees, removing every shoot, leaf, and stem section by tiny section and transporting them back to their underground chambers. They don't eat this material. Instead, they chew it up to form a compost on which they cultivate a nutritional breadlike fungus whose tiny white fruiting bodies provide them with food. The species has evolved different physical castes, each specializing in its own social tasks. Most of the workers are tiny minors ("minimas"), which tend the nest. 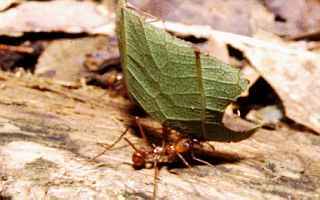 The cutting and carrying is performed by intermediate-size workers ("medias"), guarded by ferocious-looking "majors" about three-quarters of an inch long.